Spy-C Thai Carlton uses their own specialised couriers to deliver their food. Deep fried been curd served with a special peanut sauce. Mixed vegetables, fine noodles wrapped in pastry and deep fried. Mixed vegetables with spices, wrapped in puff pastry. Minced chicken and prawn with corn, peas and chestnuts wrapped in pastry and deep fried. Deep fried spicy fish cakes with green beans and lime leaves. Calamari rings marinated Thai style with a coconut crumb. Marinated chicken grilled and served with a peanuts sauce. 1 Each of the following: spring roll, curry puff, satay chicken and chicken wing. Rice paper rolls with fresh vegetables, chicken and prawns served with a special dipping sauce. Deep fried soft shell crab coated with a light seasoned batter. Deep fried prawns with coconut crumbs served with sweet chilli sauce. Marinated grilled pork served with Thai dressing. Hot and sour chicken soup with fresh mushrooms. Chicken soup with coconut milk, galangai and mushrooms. A delicate soup with chicken, vegetables and clear noodles. Minced pork and prawn wonton pillows served in a tasty clear broth. Hot and sour prawn soup with fresh mushrooms. (Papaya salad Thai or Laos style) The taste of Thailand, papaya salad with cherry tomatoes, green beans, peanuts, fresh chilli and lime juice. Thai pork salad with Thai herbs, tomatoes, onion and dressing. Vermicelli salad with minced pork, Thai pork roll, peanut, red onion, fresh Thai herbs and Thai dressing. Minced chicken cooked with zingy lemon juice, Thai herbs and chilli. Beef salad with vegetables, fresh herbs, lime juice and chilli. Sliced beef or pork mixed with Thai herbs, rice crumbs, chilli shallots and lime juice. Grilled chicken breast and black mushroom salad with fresh vegetables and a light Thai dressing. Deep fried fish fillets mixed fresh vegetables, lemon, juice, Thai herbs and cashew nuts. Seasoned king prawns with lemon juice, red onion, chilli and lemon grass. Mixed with Thai herbs, rice crumbs, chilli and lime juice. Spiced chicken, cashew nuts, chilli jam and vegetables. Spicy stir fried basil leaves, chilli and vegetables. Aromatic stir fried ginger with onion, shallot and mushrooms. Stir - fried vegetables mixed with rich oyster sauce. Thai sauce sweet and sour sauce with vegetables. For the lovers of heat, stir - fried with chilli and a variety of Thai herbs. A crowd favourite, eggplant stir - fried to perfection with chilli and basil leaves. Stir fried garlic, pepper and vegetables. Green beans, flavoured with Thai chilli paste topped with lime leaves. Mixed vegetables topped with homemade peanut sauce. Stir fried with red curry paste, veggies and Thai herbs in a spicy sauce. Mild creamy curry with coconut milk. A Thai classic curry bursting with flavour. Red chilli paste base curry cooked with coconut milk, fresh vegetables and basil leaves. A warming spiced curry with potatoes and pumpkin. A hot curry with spices, Thai herbs and vegetables. Chunky tender beef stewed in a curry paste sauce with sweet potatoes and peanuts. Indulgent pieces of duck in a rich curry with lychees, pineapples, tomatoes and basil leaves. Chargrilled marinated chicken pieces served with sweet chilli sauce. Grilled marinated pork neck, Thai herbs, served with tamarind sauce. Grilled octopus with crispy garlic, coriander and sweet chilli sauce. The most popular Thai noodle dish, thin noodles with egg, bean sprouts, peanuts and tamarind sauce. Delicious stir fried flat noodles with carrot, Chinese broccoli, soy sauce and egg. Chilli flat noodles with egg, vegetables and basil leaves. Stir fried egg noodles with vegetables and soy sauce. Stir fried flat noodles with peanut sauce, vegetables and egg. Rice noodle strip with bean sprouts crunchy onion in a mild coconut broth. Vermicelli noddle stir fried with egg, vegetables and suki sauce. Thai style fried rice with onion, egg and vegetables. Hot and sour fried rice with chilli, lemongrass and kaffir lime leaves. Special fried rice with tuna, chilli, egg, onion and vegetables. Fruit fried rice with pineapple, sultanas, peas, carrot and cashew nuts garnished with shallots and coriander. A must try spicy dish made with stir fried crispy pork belly and Chinese broccoli in a special sauce. Stir fried crispy pork belly with chilli, garlic, vegetables and basil leaves. Stir fried crispy pork belly with red curry paste, green beans and thinly sliced kaffir lime leaves. Lightly battered tender squid served with salad and sweet chilli sauce. Deep fried perch fillet with three flavoured sauce. Mixed seafood salad with chilli jam, lemon grass, onion and Thai herbs. An array of seafood stir fried with vegetables, chilli jam and sesame oil on a hot plate. Cooked with mild chilli paste, coconut milk, vegetables and lime leaves. WARNING you might get addicted, extra crispy fried chicken wings using a special spy-c marinade. Delicious Thai style mussel omelette with bean sprouts and shallots. Combination seafood stir fried with dry red curry, coconut milk, veggies and Thai herbs. 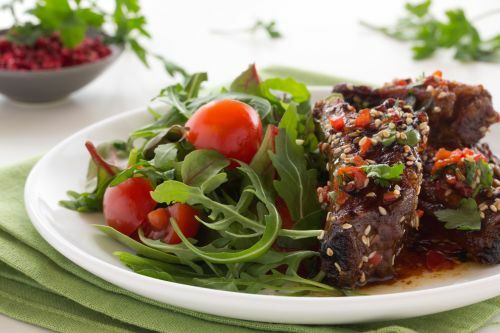 Grilled scotch fillet with spy-c sauce and fresh salad, every mouthful is a slice of heaven. Stir fried octopus with chilli jam, garlic, onion and vegetables. Stir fried prawns with curry powder. Diced salmon fillet tossed with Thai herbs, rice crumbs, chilli and lemon juice. Deep fried whole fish served with a Thai dressing and a tangy apple salad. Shredded green papaya salad with chilli, lime juice, salted crab and Thai anchovies. Tender soft bone pork in spicy and sour soup with mushroom and Thai herbs.